If you are going to stay in a town like San Miguel for awhile, you tell yourself that you’re going to stay away from other Americans and drink only in the bars where there are no tourists and eat in restaurants where there are no menus and the owner does not greet you in English, but then a day comes when you’re feeling out of sorts and long for the familiar rather than the exotic and so you go and have a drink at a place like Harry Bissett’s. So she moved to San Miguel some 14 years ago. There are a lot of Carol Romano’s in San Miguel. It’s a very matriarchal town. Anyway, I wandered into Insh’ala Saturday morning, mostly because I had passed it by a dozen times and still had no idea what it was, and there was Carol and we got to talking and she told me that if I was around, I might want to have a drink with her and some of her friends at Harry’s later that night. 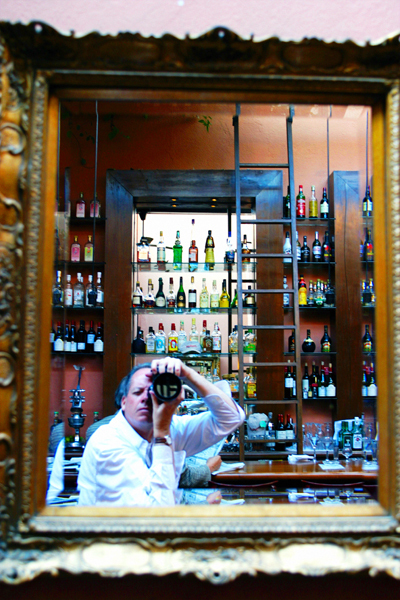 Self-portrait at Harry's bar in San Miguel. Photo by David Lansing. So here I am. But there’s no Carol. Possibly because it’s still a bit early. There’s a young woman sitting at the bar with a red-faced man who is very boisterous. They’re both drinking martinis although the man is drinking them a lot faster than the woman. He asks her, in a voice loud enough for everyone to hear, why she has come to San Miguel by herself if she is married. “Trouble back home?” he says with a smile and a wink. The woman says she often travels by herself because her husband, Golden, refuses to fly. Our drinks came and then Carol ordered some salvavidas—ringlets of calamari and oyster poboys. It seemed odd to be in San Miguel in a bar named Harry’s drinking martinis and eating oyster poboys on a Saturday night but I can’t say it was an unpleasant experience. I just want to finish my story about Tio Lucas. As I said, everything about the evening had been a little bit off beginning with the fact that even though this is one of San Miguel’s most popular restaurants, it was a very slow night. And then there was the odd couple dining beside me, a middle-aged woman from New York and her mother who, it appeared, lives here in San Miguel. I couldn’t quite put my finger on it but neither of the two women seemed to be particularly comfortable with the other. The daughter, who was pasty and a little over-weight, just seemed to have the air about her of someone who is finding it difficult to navigate through life’s daily challenges, and her mother—who was extremely attractive and very well dressed, seemed almost embarrassed by her rather mousy-looking offspring. If I had to guess, I’d say the daughter had recently had some rather serious mental problems. Perhaps depression or a break down of some sort. And she was in San Miguel to recover. With a mother who, obviously, wasn’t entirely sympathetic. I was watching the two women and trying to figure this all out when a jazz band started playing in the corner of the restaurant. The music annoyed me. The band wasn’t very good and it allowed the mother and daughter to continue to wolf down the wine without continuing their strained conversation. The band was made up of a cross-eyed bass player who grunted his way through certain songs as well as a hawk-faced drummer who wore his shirt open to the navel, highlighting a silver coke spoon on a chain over his hairless chest. The third member of the trio, a saxophonist, seemed to be the leader of the group. He was middle-aged, in denim jeans and a guyabera shirt. He had Einstein-like hair and an untrimmed goatee. The weird thing was that the young woman dining with her mother seemed to recognize the saxophonist. All through the set, she kept putting a single hand in the air and waving at him, trying to get his attention. Even though she was only five or six feet away and the only other person in the room was me. Eventually the trio took a break and the saxophonist, not looking particularly pleased, went over to the table with the young woman. “You did,” said her mother. The saxophonist slowly nodded. “You look nice too,” he said. Their heads bobbed up and down while they tried to figure out what to say next. “I’m doing great,” the young woman finally said. After he left, the mother quickly asked Max for the check and the two women left before the music started up again. I watched as the mother hurried out the door, her daughter trailing several feet behind her. I like Tio Lucas. It’s not the best restaurant in town but the charming owner, Max, is very friendly and always gives me a good table, even when I am alone as I was tonight. The best tables are in the courtyard beneath a leafy ficus tree that is hung with those punched tin star lights known as Moravian estrellas. I don’t know why but I’ve always loved these Mexican star lights and always thought that someday I would string dozens of them over my patio, the way Dianne has done on the rooftop terrace atop her B&B, Casa Luna Pila Seca. 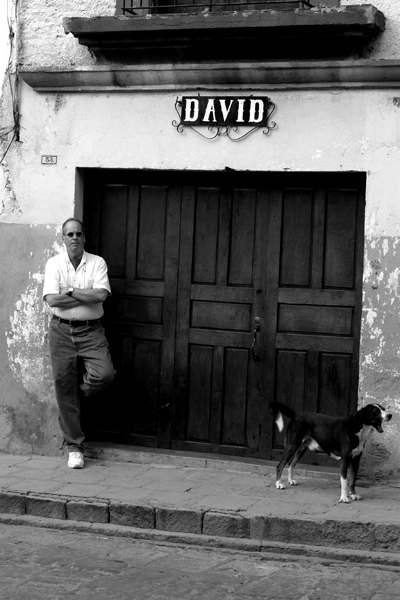 The author and a street dog in San Miguel. Photo by David Lansing. Although it was almost nine, there was only one other party dining, two women—a mother and her daughter, I imagined—who were quickly drinking glasses of red wine and seemed uncomfortable with each other. The daughter looked to be in her late 30’s and was homely. Her mother was all dolled up and wore a low-cut peasant blouse accenting her figure. Because they were sitting right next to me, I kept catching snippets of their conversation. The daughter was from New York. The mother, who had long, bleached-blond hair pulled back into a ponytail, seemed to be just drunk enough to prefer listening to her daughter ramble on while doing little talking herself. It seemed from the conversation that the mother was a widow who lives in San Miguel and perhaps was trying to convince her daughter to move here as well. I got the feeling that something had happened to the daughter and that was part of why the conversation was so uncomfortable. I ordered a Negra Modelo and though there were several waiters leaning against the walls, talking in whispers while playing with their bow ties, it took forever to get my beer and when it came it was not a Modelo and the waiter realized it the same time I did and, chagrined, apologized and hurried away with it. Usually when I come to Tio Lucas I have the Caesar salad, which they prepare at the table, the way they used to years ago at any good restaurant, and the arrachera, which is a grilled flank steak. But I wasn’t all that hungry so instead I ordered the tacos Chihuahua, something I hadn’t had before. They came about the same time my beer arrived. The meat in the tacos had a bitter, sour taste to it, like beans that have sat at the bottom of a pot for a week, so I concentrated on the guacamole and chips, which were very good, and a little salad. After awhile I pushed the plate to the side and ordered another Negra Modelo and this time it came immediately and was very, very cold. That’s when Max came over and asked me, in perfect English, if there was anything wrong with the tacos Chihuahua. As I said, I like Max. I told him they were fine. But it was good? he asked. Yes, I told him, they were fine. I sat around the restaurant slowly drinking my beer. A jazz band started playing up on a little stage set up in the corner of the room. When they took a break there was an interesting exchange between one of the musicians and the young woman from New York but I’ll save that story for tomorrow. After awhile I paid my bill and then went for a walk along Mesones under the yellow street lights. I was feeling tired and maybe a little bit lost, the way I sometimes feel when I’ve been traveling for a long stretch of time. I kept going up one street after another until I suddenly realized that I’d been walking in the opposite direction of where I wanted to go and that it would take me a good hour to get back. So instead I flagged down a taxi and had him take me to Calle Aldana across from the Parque Benito Juárez. Neither one of us spoke. When I got back to my casita I was so tired that I got into bed without taking my clothes off. One of the landlady’s cats, Chica, came in from hunting moths in the courtyard and nestled at my feet. For tonight, I let her stay. I love to walk down my little street at sunset to the Jardín and take in the scene. It’s free open-air theater. Every bench is filled with people eating lime pop sickles and dark purple hibiscus flower frozen ice or ears of roasted corn slathered with mayonnaise and chile. On the paseo facing the slouching pink church known simply as La Parroquia are vendors selling bags of pork rinds and bottles of Coca-Cola or the typical Mexican street food: tortas, tamales, potato tacos. Young men, some wearing cowboy hats, parade up and down the street in front of the church selling Mickey Mouse balloons and foam lizards on metal leashes that seem to crawl over the cobblestones. A few minutes before the sun sets, thousands of boat-tail gackles begin to fill the laurel trees in the Jardín, twittering and whirring and generally putting up a ruckus every bit as loud as the bells tolling across the street at the church. It’s a mystery as to where these birds, numbering in the thousands, come from or where they spend their days, but this is where they spend their evenings. Beneath the portals on the upper side of the plaza are carts lit by kerosene lamps where old ladies call out “Elote, elote hoy!” Another cart sells cups of small fresas and another menudo. There are old Mexican cowboys getting their dusty boots polished while watching the parade of young girls who hold hands and walk very, very slowly in a counter-clockwise path around the park. And everywhere there are children. 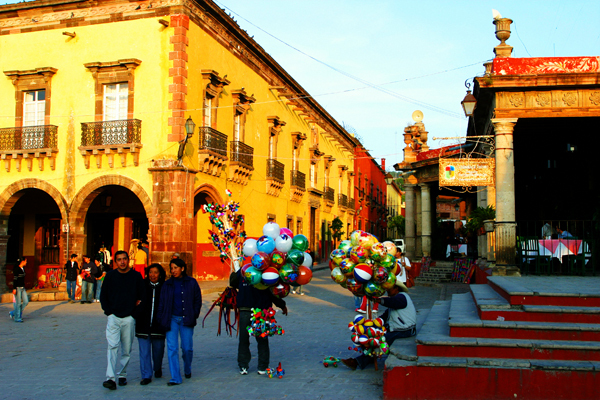 San Miguel de Allende is as surrealistic as a Gabriel García Márquez novel, as mystical as an Octavio Paz poem, and as vibrant as a Frida Kahlo painting. During the Colonial period, when thick veins of silver in the nearby hills made the town as rich as the fabled Seven Cities of Cibola, palatial mansions and ornate churches exploded across the hills of Móctezuma, to which the town clings, like Roman candles on a dark night. The streets may not have been paved in gold, but some of the chapels and vaulted living rooms were certainly gilded in the precious metal. It was the town’s Golden Age. 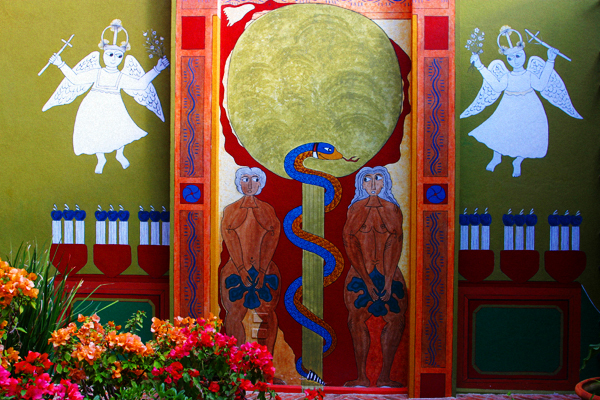 Elaborate carved-wood doors, protecting elegant residences, fronted the Jardín, the town’s communal living room. On Saturday evenings, young men dressed in embroidered shirts and high-waisted jackets wooed beautiful dark-haired women by hiring the mariachi players who waited to be beckoned from beneath the portales, the cool stone arcades on either end of the garden. Ancient women sat next to small carts with kerosene lamps selling roasted corn dusted with cinnamon while Mexican cowboys admired the silver trim on belts and boots being sold in the markets. And everywhere there were children scurrying about, chasing dogs or pigeons or each other. 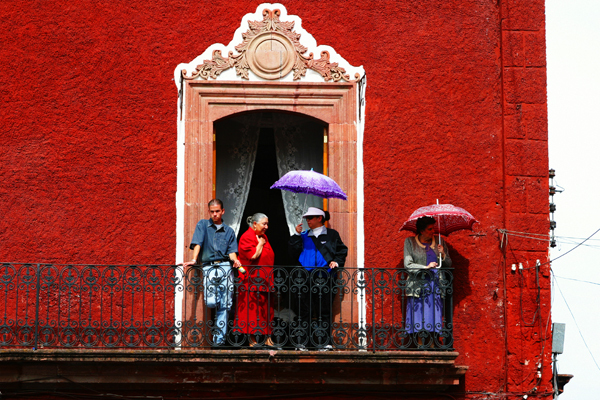 Balcony scene above the Jardin in San Miguel. Photo by David Lansing. The thing is, it is still that way, though now the young men are more likely to wear crisp Polo shirts and the women prefer skin-tight black pants instead of the long, gathered skirts and colorful rebozos of their ancestors. In other words, a hundred years of solitude. In the end, this is what saved San Miguel.